The annual general meeting of the Jewish Seniors Alliance was held on Oct. 11 at Congregation Beth Israel. As is customary, the AGM was followed by a gala dinner during which JSA honoured dedicated volunteers from three community organizations for their service to seniors in Vancouver. The meeting was called to order by JSA president Ken Levitt. He introduced Rabbi Jonathan Infeld of Beth Israel, who gave a short d’var torah on the importance of community actions and involvement with seniors. Levitt then asked everyone to rise in acknowledgement of JSA members who had passed away over the last year. Several speakers offered greetings to JSA: Isobel MacKenzie, seniors advocate of British Columbia; Michael Lee, MLA for Vancouver-Langara; Ezra Shanken, chief executive officer of the Jewish Federation of Greater Vancouver; and Gudrun Langolf, president of the Council of Senior Citizens’ Organization of British Columbia (COSCO). Reports were presented by JSA treasurer Larry Meyer; on peer support services by Gyda Chud for Pam Ottem; on membership by Binny Goldman; from Levitt, as president; and from the nomination committee by Marilyn Berger, who was especially emphatic, urging people who receive Senior Line magazine and are not JSA members to sign up. For the B.C. Ministry of Health to provide the 25% more effective flu vaccine free of charge. It presently costs $75 for the high-dose flu shot. The implementation of a federal pharmacare program. For the City of Vancouver to allow applications for the provincial homeowners grant to be done in person, without use of a computer, as many seniors have difficulty using computers or do not have access to the internet. For the B.C. government to initiate a poverty reduction program similar to those that exist in other provinces. To reduce the need for food banks – JSA had made a presentation to Federation concerning the Food Security Program. After the reports were completed, Levitt adjourned the meeting and invited everyone to be seated at the festively decorated tables. About 170 supporters of JSA enjoyed a glass of wine and a salmon or vegetarian lasagna dinner that was followed by the presentation of the awards. This part of the evening was presented by emcee Ed Gavsie, who called upon Langolf to make the presentation to Sheila Pither. Pither has been active with COSCO for 18 years. For the past 10 years, she has coordinated the organization’s Health and Wellness Institute, promoting its expansion from one workshop topic to more than 40. Pither said she was honoured to have been chosen and was grateful to be at the ceremony with friends and family, at age 86, to accept the award. The next awards went to Muriel Morris and Gary Zumar of JCC Showtime. Maurice Moses presented to Morris and Arnold Selwyn to Zumar. Morris has been a volunteer piano accompanist since high school. She has accompanied more than 210 concerts since joining Showtime in 2013 and she noted the pleasure she gets when they perform at seniors facilities and she sees the people come alive to the music and the dancing. Selwyn recounted how Zumar, with his wide experience in audio-visual technologies, has volunteered his services to many Jewish organizations. Zumar started with Jewish Heritage Players more than 40 years ago and has continued for more than 12 years with Showtime. Selwyn called him a volunteer’s volunteer. Zumar responded by thanking everyone at Showtime for this honour. Toby Rubin of the Kehila Society then presented the final award to Pat Hoffman. Hoffman became involved with Kehila’s Monday Seniors Luncheon at Beth Tikvah 15 years ago. She has been involved in the working committee as the program has expanded to include activities such as English-as-a-second-language, fitness and entertainment. Rubin described Hoffman as the lifeline of the program, the first to arrive and the last to leave. Hoffman expressed her appreciation for the recognition and said she gets much satisfaction from being a volunteer. One of the community’s most dedicated and inspiring longtime leaders, Serge Haber, will be honoured on June 10, coinciding with a significant occasion in his life, his 90th birthday. Haber has always cared passionately about community seniors and the Jewish people in general. Their well-being is on his mind constantly and, yes, anytime day or night, he’ll earnestly voice his concerns. The tribute to this prominent community personality will take place at the Jewish Seniors Alliance (JSA) Chai Tea. The afternoon (2:30-5 p.m.) at the Peretz Centre for Secular Jewish Culture will see the serving of party sandwiches, fruit and dessert, live entertainment by Dave Ivaz Music, caricatures by artist Katie Green, door prizes and more. It is most fitting that this tribute be mounted by JSA, as Haber was at the forefront of its formation and currently serves as its president emeritus. His dedication to the Judaic directive of tikkun olam (repairing the world) has continued in word and action throughout the years, as he has not only initiated JSA and helped the association, but many other Jewish causes, as well. Current JSA president Ken Levitt stressed that one reason the organization has evolved to offer so many programs and services is because of Haber’s efforts. Among other things, Haber has championed vocally and positively for the quality of life of community seniors. Haber’s experiences profoundly shaped his character. Born in Romania in 1928 to Leon and Liza Haber, he lived among the horrors of pogroms and the Holocaust, to which he lost family members – and which he barely survived himself, due to fortunate circumstances. At the end of the Second World War, Haber took two years of university in pharmacy in Bucharest. An extensive “real-life education” followed, when he left Romania in 1947, traveling to and living in Austria, then Italy, France, Cuba, Montreal (in 1950) and Dallas (1967), followed by stays in Toronto, Montreal and, finally – and fortunately for our community – moving to Vancouver in 1978. Haber attributes the impetus for his extensive community service to his beloved wife Elinor, z’l, who he met and married in 1955 while in Montreal, and to their three children. Haber’s leadership has seen him serve for decades in key executive positions for a variety of major Jewish organizations, including the United Synagogue of Conservative Judaism (highlighted by a two-year term as vice-president), Congregation Beth Israel (with 18 years of executive, chairmanship and men’s club leadership), Vancouver Holocaust Education Society (passionately urging racial tolerance at its annual symposium and ongoing school programs) and Hillel BC at the University of British Columbia (helping bring about a much-needed new facility). Haber served 19 years on the Louis Brier Home and Hospital board and was a director of the Jewish National Fund for 18 years. Additionally, deeply religious, Haber started a new Conservative congregation, Shaara Shalom, in Laval, Que., in 1958; continuously helped lead religious services at Vancouver’s Beth Israel; and has taken a key role in daily and Shabbat service leadership at the Louis Brier – for 25 years straight. In recognition of these accomplishments, Haber has been honoured throughout the years by numerous organizations, including the Louis Brier, as one of its Eight Over 80 recipients; by Beth Israel, with its President’s Award for community involvement; and by Simon Fraser University, which named him Man of the Year, the first Jewish person to be so recognized. And, he served the community even in his work – owning and operating Kaplan’s Delicatessen for 23 years. Today, Haber’s children are “always there for him”: Wanda, a social worker, in Toronto; Geoffrey, a Conservative rabbi, in Toronto; and Stephen, in the computer field, in Marysville, Wash. As well, there is his sister, Sidonia, in Tel Aviv, and his dear companion here, Sheila Gordon. Ever on his mind are seniors and, especially, the Jewish Seniors Alliance. Haber has expressed hope that seniors here will soon have their own building, providing a variety of needed services. “I have an unending love for the Jewish people generally and, in particular, for those in our community,” he emphasized. Abundant numbers of people throughout the community would affirm that the feeling is mutual. To celebrate with Haber and wish him mazal tov on his 90th, join the JSA Chai Tea on June 10. Tickets ($36) may be purchased from the JSA office at 604-732-1555 (press 1 for Rita Propp) or at the door. Bob Markin served on the editorial staff of the Jewish Western Bulletin for 16 years, and has written numerous freelance stories and articles throughout the years. He is a member of the editorial committee of the Jewish Senior Alliance’s Senior Line magazine. On Nov. 24, the first session of the 2017-18 Empowerment Series started with a bang. Almost 80 people came out to launch the series’ season, which has the theme of Laughter and Music: Feeding the Soul. This first meeting was co-sponsored by Jewish Seniors Alliance and Sholem Aleichem Seniors of the Peretz Centre for Secular Jewish Culture, and it took place at the centre. Featured speaker Matthew Gindin spoke on the topic The History of Jewish Humour. Gindin is a journalist, lecturer and teacher, and a regular writer for the Jewish Independent. Gyda Chud, coordinator of Sholem Aleichem Seniors and vice-president of JSA, began the session by introducing JSA president Ken Levitt, who spoke briefly about JSA, and urged those who hadn’t yet joined, to become supporters and members. Gindin began his talk by posing the questions, Why speak of Jewish humour; why do these words go so well together? He then proceeded to answer the question. Jews have been over-represented in the comedy scene. At one time, they comprised 75% of the comics in America, while they were less than three percent of the population, he said. Humour has a long tradition in Judaism dating back to biblical times. The name Yitzchak, Isaac, means “he will laugh,” explained Gindin. The prophet Elijah said that two jesters in the marketplace already had a place in the World to Come because they made people laugh. Reb Nachman of Bratzlav, the founder of the Chassidic movement, preached about the importance of happiness. Sigmund Freud also spoke of happiness and humour in his book Jokes and Their Relation to the Unconscious. Jews are known for making fun of themselves, said Gindin. They have used humour as a means of preparing for things that could go wrong. It was a method of coping with the many negative experiences in their lives. He pointed out that this type of humour was mainly a product of Ashkenazi culture. Gindin told many stories and had the audience in stitches. He then asked if there were questions or comments and if anyone had any good stories. The audience responded with many amusing jokes of their own. Chud thanked Gindin and commented on how well he wove the theme of humour into its time and places and how well he explained how the words Jewish and humour went together. She then invited everyone for coffee and dessert. 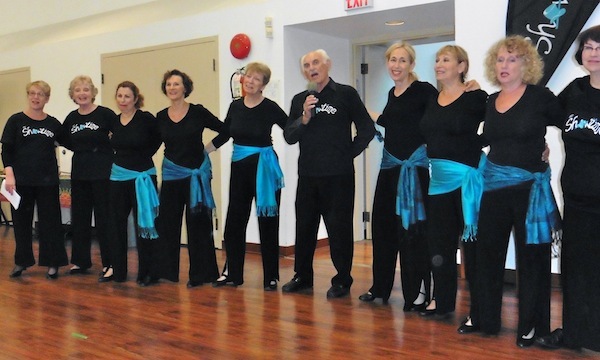 The second session in this season’s Empowerment Series will take place on Jan. 24, in cooperation with Jewish Community Centre Seniors and will feature the film Broadway Musicals, A Jewish Legacy. This documentary, by Michael Kantor, narrated by Joel Grey, explores the unique role of Jewish composers and lyricists in the creation of the modern American musical. There will be three more sessions on the Laughter and Music theme: March 21, with Temple Sholom seniors; April 17 with Beth Israel seniors, in conjunction with Jewish Family Services’ lunch program; and June 25, with Kehila Society in Richmond. For more information, visit jsalliance.org. Shanie Levin, MSW, worked for many years in the field of child welfare. During that time, she was active in the union. As well, she participated in amateur dramatics. She has served on the board of the Jewish Federation of Greater Vancouver and is presently on the executive of Jewish Seniors Alliance and a member of the editorial committee. The annual meeting of the Jewish Seniors Alliance was held on Sept. 14 at Congregation Beth Israel. The business meeting was followed by a dinner and awards ceremony. The business portion of the evening was called to order by JSA president Ken Levitt. Prior to the presentation of committee reports, a number of organizations offered greetings. A d’var Torah was delivered by Beth Israel’s Rabbi Jonathan Infeld, who emphasized that, according to Jewish law, we are not to cast aside seniors as they are at the heart of the community. 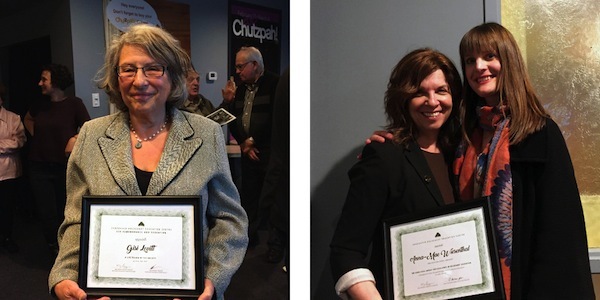 And both Ezra Shanken, chief executive officer of the Jewish Federation of Greater Vancouver, and Gudrun Langolf, acting president of the B.C. Council of Senior Citizen Organizations (COSCO), also said a few words. Following the approval of the agenda and the minutes of last year’s AGM, Larry Meyer delivered the treasurer’s report. He outlined the various funding sources of JSA – government, corporate and private grants, as well as the $18 annual fee from members/supporters. 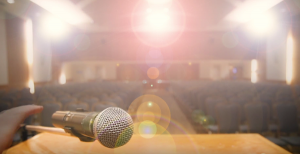 He also listed the programs this money supports, such as peer counseling, Senior Line magazine, the fall symposium, the spring forum and the Empowerment Series, as well as the website, jsalliance.org. Pamela Ottem, chair of the Peer Support Program, outlined the various aspects of the service. Peer counselors are required to take 55 hours of training prior to being assigned a client. They are given ongoing support in their work by Grace Hann, who is also the trainer, and Charles Leibovitch, who is a social worker. It takes 15 hours of training to become a Friendly Visitor. These volunteers visit shut-ins and lonely seniors; another part of the program is friendly phone calls and service information and referral. The peer support program has 56 trained volunteers serving 70 seniors. The JSA’s Ambassador Program, whose goal is to raise awareness of elder abuse, started with a one-year grant and has been incorporated into the other offerings. Hann, Leibovitch and some of the volunteers make presentations to other seniors groups about their activities. Binny Goldman reported that JSA has 596 members/supporters, of whom 320 are individual members, 150 are members of the Most Russian Bridge group and 21 are from affiliate organizations. In Levitt’s president’s report, he briefly reviewed the activities of the JSA, emphasizing that the organization would not exist if it were not for the active involvement of its volunteers. He pointed out that the peer support program alone, if it were carried out by paid staff, would cost much more than JSA’s total budget. He thanked everyone, both staff and volunteers, who have worked so hard and contributed so much over the past year. Marilyn Berger presented the report of the nominations committee. She read out the slate for the coming year and moved for acceptance. Two former board members were mentioned, Edith Shier, who has passed away and was the previous editor of Senior Line, and Milton Adelman, who has retired from the board but was for many years the treasurer of JSA. Levitt then called for the adjournment of the business part of the evening and everyone was invited to move to the tables for dinner, volunteer recognition and musical entertainment. Jazz singer Jill Samycia entertained the approximately 150 dinner guests, after which came the awards presentations to volunteers. As has become JSA’s custom, several organizations were asked to nominate senior volunteers who have spent time and energy enhancing the goals of their organizations. Karon Shear, who was coordinator and administrator of JSA from 2005-16, was nominated by JSA. Her service to seniors, and enthusiastic marketing, played a vital role in the development and growth of the organization. In presenting her with the award, Serge Haber described her as the heart and soul of JSA. He spoke of the countless hours she spent, off the clock, on weekends, working at home; how she produced the Senior Line magazine basically on her own for a time. Sylvia Yasin was nominated by the Jewish Family Service Agency. Yasin has volunteered for many years with the Jewish Food Bank and was instrumental in creating relationships with various groups and individuals and obtaining ongoing donations of supplies for school-aged children. She was presented with her award by Debbie Rozenberg, who noted that Yasin began volunteering while still working full time. Yasin has been involved with the Terry Fox Run and with ORT. Among other things, she organized the gift wrapping in shopping malls that raised funds for ORT. She also helps set up and clear for the seniors lunches at the Kehila Society and is still involved with the Jewish Food Bank. 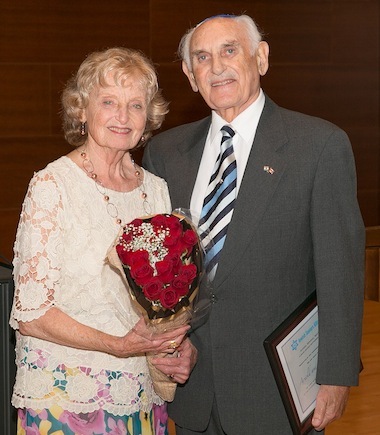 Nassa and Arnold Selwyn were nominated as a couple for their longtime volunteerism at Congregation Beth Israel. Infeld talked about Arnold’s singing for the congregation and Nassa’s beautiful sewing of the parochet (ark curtain) and the siddur covers. Together they bring holiness into the world, said the rabbi. Both of them act as greeters and have been part of many other committees. They are also active in the general community and are part of Showtime, an entertainment group of seniors. All of the honourees expressed their thanks and appreciation to JSA and the nominating organizations. The message to all was, volunteer whenever you can and wherever you can – it will bring you feelings of fulfilment and joy. Samycia performed again, during dessert, and a number of the guests got up and danced to the music. The evening ended with a draw for door prizes. Barbara Bronstein and Larry Shapiro were co-chairs of the event. In the Pirkei Avot (Ethics of Our Fathers), we learn the saying, “Teach us to number our days so that the experiences of life should provide us with wisdom that only years can bring.” How fortunate we are that we have this exceptional woman, Sylvia Hill, admired by all who know her. Sylvia has been part of the Jewish Seniors Alliance of Greater Vancouver since its inception and is an honourary life member. On June 6, Sylvia turned 103 years old. We honour her as she continues to inspire us with her staunch resolve to advocate for better lives for seniors – be it in the home where she was once president of the residents or within the community at large. 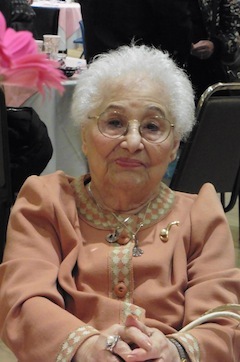 In the newsletter put out by the Snider Campus, Sylvia was called “the Face of Louis Brier” and was honoured during morning services on June 10, with a special kiddush following. On the day, we of JSA proudly wished you, dear Sylvia, a yom huledet sameach, a happy birthday, and we wish you continued good health for many years to come … beez (until) 120, and thriving, as has been the theme of JSA’s Empowerment Series this season. Continue being a beacon of light for us to follow! With love and deep respect. 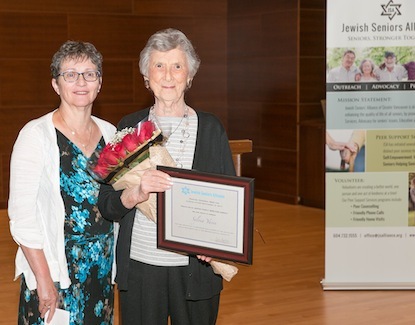 At the annual general meeting of the Vancouver Holocaust Centre Society for Education and Remembrance on June 14, Gisi Levitt received a Life Fellow Award for her 12 years of service as VHEC’s director of survivor services. The Meyer and Gita Kron and Ruth Kron Sigal Award for Excellence in Holocaust Education was awarded to Anna-Mae Wiesenthal, who teaches Jewish history and English at King David High School. She recently worked together with VHEC on the Student Docent Training Initiative, a successful pilot project in which volunteer students from KDHS were trained to become docents. Two of the student docents, Milena Markovich and Jacqueline Belzberg, did an outstanding job of sharing with the audience their experiences of guiding their fellow students through the VHEC exhibition In Defiance: Jewish Resistance During the Holocaust. On June 20, Women in Film & Television Vancouver celebrated leaders for their outstanding work and contribution to advancing opportunities for women with their annual Spotlight Awards. This year’s recipients included Mark Leiren-Young, who received the Iris Award. The Iris Award is given to a person who has demonstrated a commitment to the promotion of female creators and their screen-based works, either through curating or programming or through print and online media sources. Named after the Greek mythological figure Iris, associated with communication, messages and new endeavours. Leiren-Young was also one of the finalists for the 2017 BC Book Prizes’ Hubert Evans Non-Fiction Prize for The Killer Whale Who Changed the World (Greystone Books). Leiren-Young is a journalist, filmmaker and author. His Walrus article about Moby Doll was a finalist for the National Magazine Award and he won the Jack Webster Award for his CBC Ideas radio documentary Moby Doll: The Whale that Changed the World. It was a banner year for the Leo Awards, which received a record 1,295 entries, from 301 unique programs in 14 different categories. Among the finalists was David Kaye – for best lead performance by a male in a motion picture for his work in Cadence and as part of the cast of Grocery Store Action Movie, which was nominated in the category of best music, comedy or variety program or series. Why do we volunteer? As a volunteer myself, I never gave this topic much thought until the editorial committee of Senior Line determined to feature volunteering in an upcoming edition. A volunteer is someone who offers their service of their own free will or without being asked. Most people who volunteer do so because they are making a contribution to society or to a selected part of society. Some volunteer because of values that have been instilled in them or are part of their heritage, or because of the examples that others have set. Volunteers are the backbone of every not-for-profit organization that exists. They run the gamut of everything that an organization does: sit on boards of directors, raise funds for the operation of the organization, plan and chart the future of the organization, visit seniors who are shut-ins or visit the sick and infirm. These are but some of the ways that volunteers make an enormous contribution. My interest in volunteering likely came from observing my parents while growing up in what was considered rural Surrey in the late 1940s and 1950s. Both were involved in the Royal Canadian Legion and the Newton Athletic Club. I became involved in a number of organizations that included the B.C. Association of Social Workers, Habonim Dror Camp Miriam, the Performing Arts Lodge, Congregation Beth Israel and, more recently, Jewish Seniors Alliance. My motivation? To use my experience in supervision, management and organizational development. What could I do to make a difference? It was important for me to believe in the purpose and direction of the organization and how I could fit in. I have never wanted to be a spectator but an active contributor to the positive evolution of an organization and, of course, to the services they provide. Norman Franks represents the quintessential volunteer. Franks is a native Vancouverite whose family has a long history in the city. During his student days at the University of British Columbia, he served as president of Hillel House. At the invitation of brothers Jeffrey and Peter Barnett, who helped pioneer the establishment of Variety Club in Vancouver, Franks became a member. He agreed with the purpose of Variety and, perhaps more important, identified with them because of being the parent of a severely challenged child. Elayne Shapray, z’l, represented a special class of volunteers for her courage and for her convictions. She was a registered nurse by profession and graduated from the Jewish General Hospital in Montreal. In her own words, “Volunteering was always in my blood and I had the luxury of not having to work. I wanted to give back to the community. I got more from volunteering.” Shapray had an enviable record for the volunteering she undertook: Planned Parenthood, palliative care at Vancouver General Hospital, helped start L’Chaim Adult Day Centre, UBC Women’s Resources, served on the boards of Jewish Family Service Agency and Beth Israel – it was Shapray who initiated the annual coat drive at BI 22 years ago. At age 39, she was diagnosed with multiple sclerosis, but she never disclosed her malady to the organizations she volunteered with so she would not receive any special treatment. Her days as an active volunteer ended about two years ago. Her most recent diagnosis was progressive secondary MS and, from 2011, she had been in the media about the “right to choose,” physician-assisted dying. She will be remembered for her caring, involvements and beliefs. defence, Zionist causes and his Masonic lodge. He became an advocate for his very independent late mother’s well-being, ensuring all her needs were being met. As a new Vancouverite, it was important for him to meet new friends and to become involved. Initially, he joined Oakridge Seniors’ Centre, where he now sits on the board of directors. Shortly thereafter, he met Serge Haber, the founder of JSA, who invited him to volunteer as a peer counselor. After meeting the program’s trainer, Grace Hann, Shapiro entered the 55-hour training program. Today, he has five seniors with whom he is in regular face-to-face contact, and he is now on the executive committee of JSA. Do volunteers make a difference? Re-read this article and you will know the answer. Ken Levitt is a vice-president of the Jewish Seniors Alliance of Greater Vancouver and a former chief executive officer of Louis Brier Home and Hospital. A longer version of this article will be printed in a forthcoming Senior Line. It was interesting to me – a person who still enjoys using one of the “original computers,” namely, the pencil – that I was about to attend a workshop entitled Technology: Give us the Tools to Finish the Job. On Jan. 27, about 100 people gathered in the Jewish Community Centre of Greater Vancouver’s Wosk Auditorium to hear three experts in the field of technology at a workshop hosted by Jewish Seniors Alliance in partnership with the JCC seniors department. It was the second session of the current season’s JSA Snider Empowerment series. JCC seniors program coordinator Leah Deslauriers welcomed the audience and outlined the afternoon’s activities, while Gyda Chud welcomed everyone on behalf of JSA. Chud explained how she was introduced to JSA via the Peretz Centre for Secular Jewish Culture four years ago and that JSA is always looking for new partners in its aim to make its workshops easily available and accessible to all who may be interested. Chud added that she hoped the Technology session would help build her own confidence when it came to computers and other aspects of the tech world. Noting that living is learning, the first speaker, Stan Goldman, demonstrated the simplicity of mobile technology. Once one learns how to use the iPad, the knowledge can be applied to the iPhone, which uses the same system, and one may watch free movies, read free ebooks and newspapers, and get email by accessing the right app. To illustrate, Goldman and Deslauriers used voice commands to ask for directions, dictate an email and do advanced math. Goldman offered a seemingly endless list of things that can be done with this technology, including Skyping with family and friends in other countries, enjoying music, playing games, etc. – all by using apps, many of which are free. The world is, indeed, at your fingertips. Philip Morris, an expert on fraud, scams and identity theft, spoke next. He said that, once we have let the world in, so to speak, we must be cautious when using our devices – protecting them with passwords, and keeping private our personal information (social insurance numbers, birth certificates, passports, etc.) and not easily accessible to hackers. Morris advised shredding all discarded documents and, when buying a new cellphone, making sure all of the personal information has been deleted from the old phone, as hackers can retrieve data from seemingly wiped phones. It is important to be alert in public places, to keep wallets and purses out of easy reach and to ensure that you have received your own credit card from the server in a restaurant. He also suggested taking a photograph of passports and credit cards in case of theft. New words have been coined, such as “smishing,” the ability to obtain information from people’s texts. Morris recommended changing passwords annually and, when writing cheques in payment for credit cards, to reference only the last four numbers of the card. To report a theft or loss, Morris gave two numbers to call to check your credit profile: 1-800-465-7166 (Equifax) or 1-800-663-9980 (TransUnion Canada). For instances of fraud, he said to call the Canadian Anti-fraud Centre, 1-888-495-8501. Mark White, “the gizmo guru,” gave advice on the latest fun gadgets, including some lesser-known ones, and where to get them. As far as finding directions, however, he warned people to keep paper maps on hand in case the technology fails to connect. White added that he reads the Vancouver Sun’s online version, and that the library offers many newspapers online to members. In order to keep Skype conversations private, he suggested using earphones if Skyping in a public place. Isaac Waldman Jewish Public Library librarian Rossana Caritey explained that the Waldman has an extensive collection of ebooks, which can be read on any device – ebook readers, laptops, for example. If someone brings in their device, a librarian or volunteer can show them how to download books. Waldman librarian Helen Pinsky handed out further information to attendees. Chud thanked the speakers, noting that each of them had exhibited in their talks the mission and ideals of JSA – that of advocating for, inspiring, educating others to be the best they can be. The audience retired to enjoy light refreshments. Long lines formed at the workstations set up in the auditorium, clearly showing the keen interest in the session. The workshop may have eased many fears, allowing timid souls to venture through the now-open doors leading to new technological possibilities. Toby Rubin, executive director of Kehila Society of Richmond, welcomed the crowd of 100 who gathered June 29 at Congregation Beth Tikvah for the Jewish Seniors Alliance of Greater Vancouver and Kehila event. Rabbi Howard Siegel, who led the Hamotzi, joked with those assembled that the reason there was no clock on the wall was because it would not suffice to record the length of his sermon (which he said he was about to deliver), as his would require a calendar. After the BBQ lunch catered by Stacey Kettleman – and just before a huge cake honoring all the volunteers was served – Rubin called up a number of those volunteers from her various committees and presented them with certificates. Rubin said that, in the audience, there were people from the Louis Brier Home and Hospital, L’Chaim Adult Day Centre, JSA, Angels There for You, CARP and seniors from Beth Tikvah, as well as people who had heard about the event through publicity. The program began with “Happy Opening“ and showcased the talents of the JCC Showtime performers, accompanied on piano by Muriel Morris and with Gary Zumar as sound technician. Each number presented new and charming scenarios, which included quick and clever costume changes. Some crowd favorites were the duets “Together” and “Let’s Call the Whole Thing Off” by Arnold and Nassa Selwyn; the guest appearance of “Dolly,” Marshall Berger dressed as a woman; Cossever belting out “Can’t Get a Man with a Gun”; Moses engaging the crowd with “Beautiful Morning”; and the striking cowgirl dance, as well as “Chattanooga Choo Choo.” Two of the last songs, “Tzena Tzena” and “Hava Nagila,” led by Moses and Arnold Selwyn, took the crowd to Israel as they sang along. Complex choreography and the blink-of-an-eye costume changes were all conceived and created by the founder of JCC Showtime, Beryl Israel, who immigrated in 2002 from South Africa, where she had been involved with a similar program. Rounding out the Showtime lineup were Sara Bernstein, Rona Black, Lisa Conn, Andria Engel, Tamar Glaser and Susan Goldstein. Just as the performers were about to leave the stage, Berger was handed the microphone and asked to sing “Happy Birthday” to his wife, Marilyn Berger, president of JSA, who was celebrating her birthday that afternoon. He was joined by all the performers in the singing of a touching rendition of the song. Marilyn Berger thanked the performers for a wonderfully joyful afternoon that traveled down memory lane and she also gave a short talk about JSA, highlighting its advocacy and its peer support program. She then handed out gifts for each of the cast, helped by Kenneth Levitt, one of JSA’s vice-presidents. 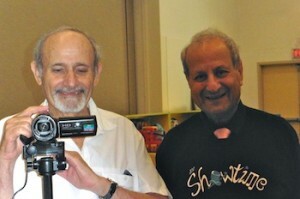 Stan Shear, with Karon Shear, JSA coordinator, by his side, made a video of the performance, which will be posted at jsalliance.org. It was an afternoon that definitely put smiles on faces and songs in hearts.